Happy New Year and hope everyone had a happy holiday season. January started off a little slow. We had a tough cold spell the first week of the year which made things a little tough. We just had to get creative. The Tampa fishing is a year around activity. Trout is a good species to begin with. The cooler temperatures bring the big Gator Trout into our area flats to feed. Hooking up with one these trophy size fish is always an option. Sheepshead are also a great species to target during the winter. These fish will move into our area to prepare to spawn in the Spring and feed heavily. They are also tasty and it is easy to limit out on them. The Tampa Bay area offers a very unique situation during the winter with our power plants. These facilities use Tampa Bay waters to cool there systems then discharges the warm water. Fishing the power plants can be very productive. They attract a number of different species including manatees. 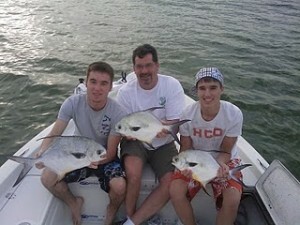 I had a trip were we caught 25 Pompano with several keepers making into the cooler. Also got a chance to see numerous manatees enjoying the warm water retreat. To book a Tampa Bay fishing charter with Capt. Will Shook, call 813-732-5971.